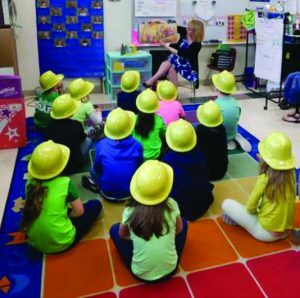 Leadership Council Southwestern Illinois administrative assistant Liz Happold reads to hard-hatted grade school students in Dupo. A work-ready labor force with the skills required by 21st century commerce and industry is the goal of the Leadership Council Southwestern Illinois’ growing Building Workforce 2030 program. Key to the ambitious effort: a new sense of cooperation and coordination between business and educators, council spokespersons say. The program complements several similar workforce development efforts — from the Missouri Chamber of Commerce and Industry’s Workforce 2030 initiative to the World Health Organization’s Workforce 2030 global strategy on health care staffing – but with an emphasis on industry segments targeted under various development plans in Metro East: crafts, manufacturing, cyber technology, healthcare, truck driving, and aviation industries. Inherent in the effort: informing both students and current members of the area workforce on the changing demands of employers and preparing them for changing job requirements, program spokesperson say. In many cases, that may mean changing the perceptions of skilled careers among students who might otherwise consider a four-degree necessary for success in life. It will also mean educating students and adults on how to gain the experience or credentials necessary for emerging job opportunities. Most importantly, it will mean working with area education institutions and businesses to make sure educational programs and industry needs are aligned, the council emphasizes. To that end, the Leadership Council plans to soon hire its first education coordinator, to facilitate cooperation among area colleges, universities, technical training centers, and employers. The application period for the new position closed Feb. 4. The new coordinator will serve as the program’s representative, primarily to high school students but also to parents, teachers, guidance counselors, administrators, and community leaders. However, the coordinator will also serve as a liaison between education and business, the council says. Council leaders say they plan to track metrics such as the ratio of target job openings to job seekers, enrollment in area trade schools, and migration in and out of the area. Emphasis will be placed on mentoring or “job shadowing” opportunities for selected students, guidance on education funding sources, and working with schools in underserved area. Already, Leadership Council staff have offered presentation during a “Manufacturing Day” career conference on the Southwestern Illinois College Granite City campus, “Career Conference” programs at junior and senior high schools in Dupo, a freshman orientation at a Granite City high school, and teacher’s meetings at Collinsville High School and Triad High School in Troy. 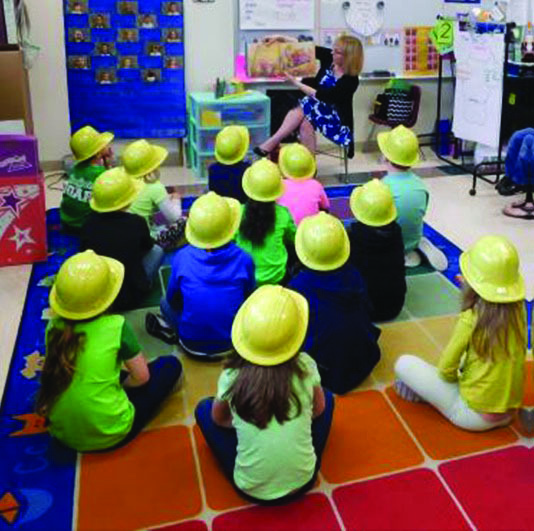 Council representatives have even read to kindergartners in Dupo and Granite City, and taken part in a reading and activity program for Freeburg third graders. The new Building Workforce 2030 comes as the Leadership Council completes a move from its original 800-square-foot office in Collinsville to a 2,000 square-foot suite at 104 Magnolia Drive in Glen Carbon – in the burgeoning I-55 Development Corridor. Celebrating its 35th anniversary, the Leadership Council Southwestern Illinois is a member-based economic development coalition, consisting of nearly 250 business, industry, workforce, education, and government leaders. Preparations for the long-anticipated reconstruction of Seiler Road in Godfrey are scheduled to begin this week. Weather permitting, crews are set to begin clearing brush along the reconstruction area — from Humbert Road to just west of Wenzel Road, according to Madison County Engineer Mark Gvillo. Utility relocation is set to begin shortly thereafter. Actual road construction is slated to begin in May. Motorists may encounter some temporary delays in the area beginning this week, Gvillo warned. The $2.3 million road construction project will extend from Humbert Road, 1.21 miles east to approximately 460 feet west of Wenzel. In addition to hot-mix asphalt repaving, storm drainage is to be improved along the roadway. Seiler Road is the major east-west county road through the area. Advisories on any road closures related to the project are to be posted to the Madison County website (www.co.madison.il.us). The Seiler Road reconstruction is the latest in a series of major road improvements in Madison County, officials say. Over the past year, the county spent approximately $4.15 million in County Roads, County Bridge and Motor Fuel Tax funds to finance various road and bridge projects, improvements and maintenance. The county also spent $1.3 million in federal funding on road construction. Engineering study costs and purchase of rights-of-way for the Seiler Road project were covered under $300,000 grant approved by the Madison County Board in 2017. A pre-construction meeting with county officials and the contractor for the project, Stutz Excavating, Inc. of Alton, was held Jan. 29. Stutz Excavating was the lowest among eight bidders for the project. Godfrey-based Lewis and Clark Community College (L&C) has begun offering courses and programming at the East St. Louis Higher Education Center (ESLHEC). Two initial courses, in computer networking and child development, are already underway. A career development course on medical assisting — part of a new High School Partnership Program with Southern Illinois University Edwardsville’s (SIUE) East St. Louis Charter High School — begins March 18, with enrollment now underway. East St. Louis residents can now also enroll in programs on the college’s main campus in Godfrey and its N.O. Nelson campus in Edwardsville; with van transportation to and from those campuses beginning this spring. The college’s new East St. Louis initiative is based on recent labor market analysis, conducted by the economic modeling consultancy Emsi, to identify career opportunities and skills gaps in the both the college district and the Metro East region. 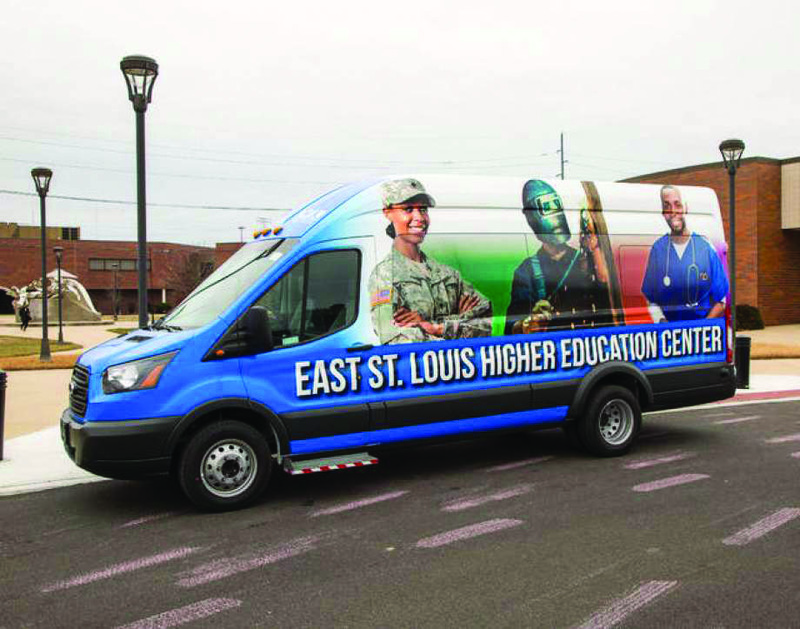 Director Dobbie Herrion and Assistant Director LaVeasey Carter are coordinating L&C’s academic efforts from the East St. Louis Higher Education Center, and have hit the ground running over the past several months. Carter and Assistant Director LaVeasey Carter are currently developing academic support services, enrollment services — such as academic advising, registration, assessment testing, interpretation of financial regulations — and student recruitment efforts for the center’s new college programs. Herrion received his doctorate of higher education leadership from Maryville University and his bachelor of science and master of science administration from Southeast Missouri State University. He has served as director of the National Science Foundation Grant at Harris-Stowe State University and as director of operations at Hickey College. Carter received his doctorate of higher education leadership from Maryville University, bachelor of science from the University of West Georgia and master of art in higher education from Southeast Missouri State University. He has served as assistant director of academic services for athletics at Eastern Illinois University and academic advisor at Southern Illinois University Edwardsville. A new administrative assistant Jacquee Schilling was added to the center staff in November, anticipating rapid growth in the new college programs. 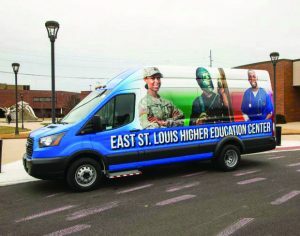 The new East St. Louis courses are being offered by L&C under a grant and directive from the Illinois Community College Board. The Bloomington, Ind.-based Carnegie Commission on Higher Education has upgraded Southern Illinois University Edwardsville to the newly created doctoral/professional universities category. The commission previously classified SIUE as a master’s-large institution. “These degrees in combination with high quality undergraduate and master’s programs provide vital paths for prospective students and offer a dramatic impact on public service, healthcare and education for the region,” Cobb continued. To qualify as a master’s-large institution, universities must have awarded at least 30 professional practice doctoral degrees in two or more programs, during a fiscal year. The program also covers institutions at least 20 research scholarship doctoral degrees, involving less than $5 million in research expenditures. The Carnegie Commission last year revised its doctoral universities categories to better identify universities offering “professional practice” doctorate degrees such as the M.D., J.D., Pharm.D., and D.M.D.